Watch our overview video or select a step below to expand it and view the details. Pay only for printing and shipping at this time. Order your tickets on the CharityMania website and receive them in about a week (rush options are also available). The printing, set up fee, and shipping costs are your only up-front costs to run a CharityMania fundraiser. If you do not sell any tickets (see next step), then you owe nothing else. Sell 1 ticket or 10,000. You keep 70% of the money you collect. You sell CharityMania Tickets (typically for $20) and keep 70% of the money you collect. Ticket holders receive premium digital music downloads and they are entered into one of our exciting sweepstakes. You keep 70% of the money you collect from ticket sales (note that some fundraisers % can vary). The profit you make per sale is yours to keep and you can spend it right away. Pay only for the tickets you sell. If you don’t sell a ticket, you don’t pay for it. 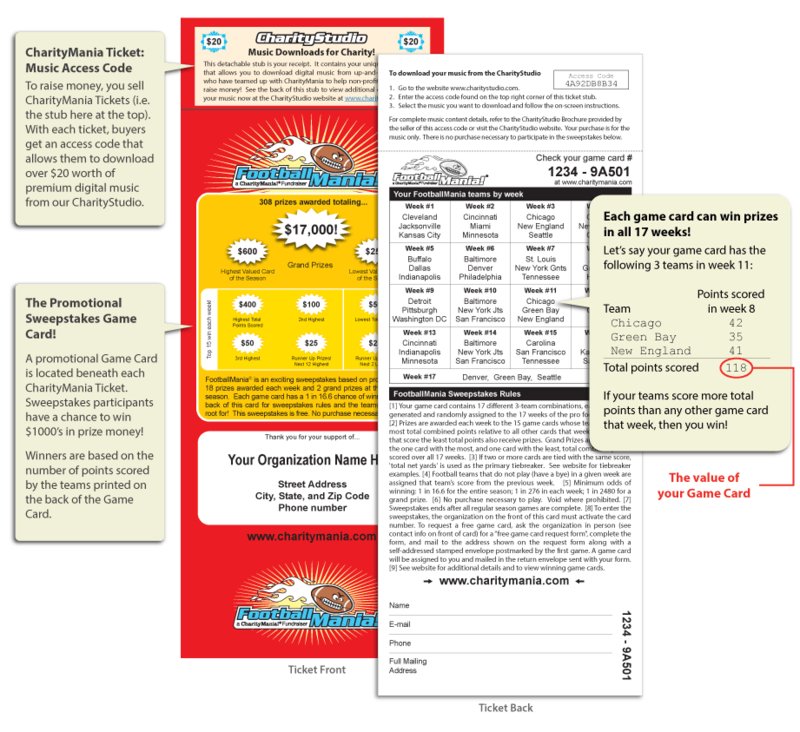 At the start of the game, you are invoiced for the tickets you sold to cover the costs of the sweepstakes. Some games vary, but generally you owe a $6 fee per $20 sold ticket. This covers the costs of the music downloads, the management of the sweepstakes, and any prize money your game card may win. You can pay this fee in one lump sum by electronic funds transfer (or by check if necessary). CharityMania calculates the winning sweepstakes game cards at the end of each week and tells you which of your cards are winners. We then send you the prize money (via electronic funds transfer) so that you can send it to your winners with personalized letter from your organization. We also post the winning card numbers on the website so everyone can see if they’ve won. based on the excitement of professional and college sports. Big profits on every ticket you sell! Determining your profit with FootballMania is easy. To raise money, you sell CharityMania Tickets for $20 and keep 70% of the money you collect. Ticket holders receive $20 worth of premium digital music downloads (read why the music is important for this fundraiser in the next section), and they are entered into the FootballMania sweepstakes. Sell 10 tickets or 10,000 tickets… you make $14 on every ticket. It is really that simple. Music Downloads and Sweepstakes Game Cards… a winning combination! To raise money, you sell CharityMania Tickets (prices between $5 and $25 per ticket) and keep 70% of the money you collect. The CharityMania Ticket (i.e. the stub at the top) contains an access code that allows the buyer to download a fantastic set of digital music from our CharityStudio site. Beneath this ticket, a promotional sweepstakes game card gives the recipient a chance to win $1000s in prize money! Check out all of our unique fundraisers based on your favorite sports. There is a legal difference between a sweepstakes and raffle. With a raffle, people pay money for a ticket that gives them a chance to win prizes. Only specific types of organizations can conduct a raffle and most states regulate how the raffles can operate. A sweepstakes is not a raffle. A sweepstakes is a promotion that provides extra incentive for people to buy a product that you are selling. The sweepstakes must have a ‘no purchase necessary’ method of entry. In a CharityMania fundraiser, the Sweepstakes Game Cards are promotion only and are not sold directly. Every time someone buys a CharityMania Ticket, they purchase over $5 to $25 worth of premium music downloads (depending on the price of the CharityMania ticket) from our CharityStudio. 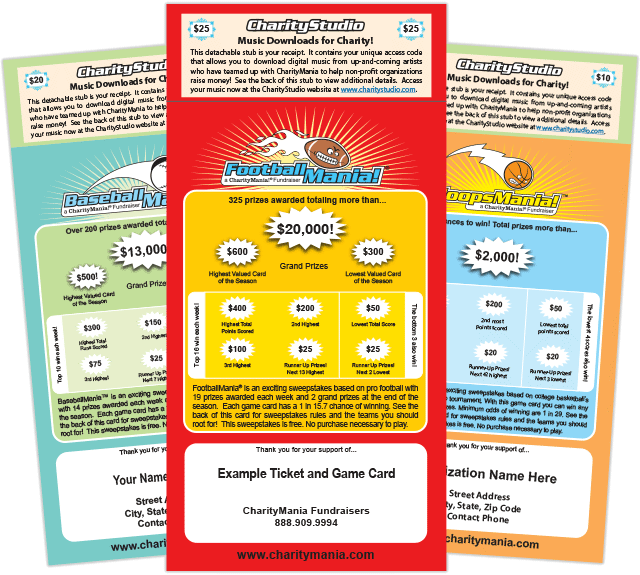 The Sweepstakes Game Card is a promotion that provides a great extra incentive for a person to support your cause. Legally, our Sweepstakes Game Cards work much like the game pieces in the Monopoly sweepstakes® at McDonald’s®. You cannot buy a Monopoly game piece directly. Instead, you purchase things like hamburgers and drinks and receive the game pieces for free. The Monopoly game pieces are promotion. All CharityMania sweepstakes are “no purchase necessary”. If someone wants a free Sweepstakes Game Card, they can come to your organization and fill out a request form (provided by CharityMania) to get a free Game Card. They mail their completed request to CharityMania along with a self-addressed stamped envelope and then we will mail the person a Game Card. We do not mail them the music download access code (because they are not paying). This process is very standard for all companies that conduct sweepstakes. Managing your fundraiser could not be easier! CharityMania provides you with a password protected website that allows you to manage every aspect of your fundraiser. Our intuitive tools will help you organize your ticket sellers, track your ticket sales, pay your invoice, and coordinate prize money payments to your winners. Our customers tell us that CharityMania fundraisers are the simplest, easiest fundraisers they have ever run. You just sell tickets and our helpful web tools will pretty much do everything else for you! When you sell your CharityMania tickets, you collect the ticket stubs from your sellers and store the stubs in a safe place. You will then “activate” each sold ticket by simply putting a checkmark next to each sold ticket number in the Fundraiser Manager. This tells us which tickets have been sold and which associated game cards to activate. We use this information to create your invoice and to know which game cards to include in the prize money calculations. You can activate the tickets as you go or all at once before the fundraiser begins. The process is super simple! With the CharityMania Fundraiser Manager, you have access to all of your fundraiser’s important financial information. You’ll know how much you’ve made and how much you owe. You can view your invoice and pay it electronically for the ultimate in convenience and tracking. Invoices are sent out after the start of the fundraiser. You are not billed until this time. You don’t pay anything until the fundraiser starts! Throughout the fundraiser, CharityMania will calculate winning game cards and pay you the prize money so you can distribute it to your winning card holders. The Fundraiser Manager allows you to track which of your game cards are winners so you know who will receive prize money. 17 Week Game – Our Most Popular! Tickets for our fundraisers are available months before the games begin. Make sure to order your tickets early enough so you have time to sell them before the games begin.